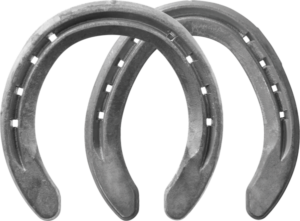 The Advantage offers excellent traction and added support, and is available in front and hind patterns. Ideal front and hind patterns make shaping and nailing more efficient. This shoe is avialable clipped or unclipped, and is punched for a SB5 nail. 1-9 $7.30/pr. 10-29 $6.75/pr. 30+ $6.55/pr. 1-9 $7.45/pr. 10-29 $6.90/pr. 30+ $6.70/pr. 1-9 $8.25/pr. 10-29 $7.60/pr. 30+ $7.40/pr. 1-9 $8.00/pr. 10-29 $7.40/pr. 30+ $7.20/pr.